Minnesota's increasing reliance on immigrants to fuel its work force can be seen at a unique neighborhood bus stop in Minneapolis. A stream of workers, many of them Somali refugees, boards a private coach that will take them to the Amazon fulfillment center in Shakopee. Amazon also arranges for the bus to shuttle workers back to their Cedar-Riverside neighborhood. This scene plays out every day just outside the Shaqodoon job center. Last month, about 20 people a day — including those who speak little English — were being hired on the spot for packaging jobs and other tasks. They're earning about $15 an hour or more, said Mohamud Noor, who runs the center. "This is real," said Noor, director of the Confederation of Somali Community in Minnesota and a candidate for the Minneapolis City Council. "It's full-time employment with benefits, and it pays well." The state's industry leaders say immigrants are needed to grow Minnesota's economy and address a labor shortage. But calls for welcoming more immigrants come as the White House and others offer proposals for more restrictive immigrant policies. President Trump is backing a proposal that would cut legal immigration to the United States in half. The bill favors English speakers and skilled workers. Minnesota's proportion of the workforce made up of people born outside the country climbed from about 7 percent to 10 percent over the past decade, according to an analysis by the APM Research Lab and Analyst Group. By comparison, about a third of California's work force is foreign-born, and it's been that way for about a decade. And in Alabama, about 4 percent of its labor force was born in another country. In Minnesota, many companies see immigrants as a potential labor pool while on the prowl for project managers and software developers. There are more than 11,000 job openings in STEM fields across the state; the median salary is about $96,000, according to figures collected by the Minnesota High Tech Association. Immigrants working in STEM fields in Minnesota are often filling "very specific roles at companies like a Thomson Reuters or a 3M," said Margaret Anderson Kelliher, the association's CEO and president. But there aren't enough qualified people locally fill them, which means employers must look beyond the borders of the state and even the nation, said Anderson Kelliher. "If it were easy to just turn on the pipeline of a highly trained scientist who could fill one of these spots, then we would just do it," she said. "To keep growing as a country, and for us as a region, we need more people." The labor shortage isn't limited to high-skilled workers. It's also playing out in Minnesota's farm fields — especially when it comes to finding experienced hands in the dairy industry. Kevin Paap, president of the Minnesota Farm Bureau, said half of the state's cows are milked by immigrants, including many who aren't authorized to be in the United States. "The consumer will have to recognize that the choice is very simple: You're going to have to allow us to import our labor in agriculture, or you're going to have to accept importing our food from other countries," Paap said. As a whole, Minnesota's labor market is skintight. There is roughly one person looking for work for every job opening. State demographer Susan Brower said the work force is aging, and there aren't enough native Minnesotans or even people from other states to replace them. "There are so many people who are close to retirement, who are moving into retirement, that it's just really hard to keep the same number of workers that we've had in the past," she said. A University of Minnesota study published in January found that in order to maintain the current average annual 0.5 percent growth rate of the labor force in the state, Minnesota would need to attract about 4.5 times the current number of people who move to the state. "Given that the prevailing trend of net migration to Minnesota is wholly comprised of international migration, it is likely that any additional migrants that the state attracts in the future will be disproportionately foreign born," said the report, authored by Ryan Allen, a professor in the Humphrey School of Public Affairs. Bruce Corrie, an economics professor at Concordia University-St. Paul, said the state is attracting talent at both ends of the spectrum — high-skill and low-skill. "Without these workers in the STEM fields as well as in agriculture and health care and hospitality industries, our economic growth will be crippled," he said. But John Phelan, an economist at the Center of the American Experiment, isn't convinced broad-scale immigration is the answer. "What you need for that — and this is crucial — is not just any body or any person that comes in," Phelan said. "To grow GDP per head, you need to make sure the people that come in are more productive than the average you already have." Phelan said he would back immigration changes that favor highly skilled labor, such as doctors, scientists and others who are highly educated. 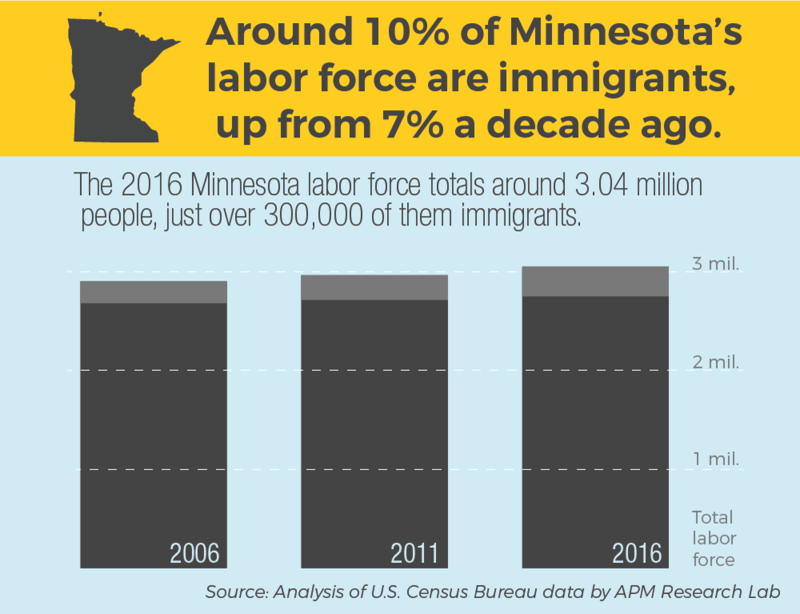 Still, one thing is clear: Immigrants are playing a crucial role in Minnesota's labor force. And that role is expected to grow — as long as immigration policy allows them to keep entering the country at current levels.